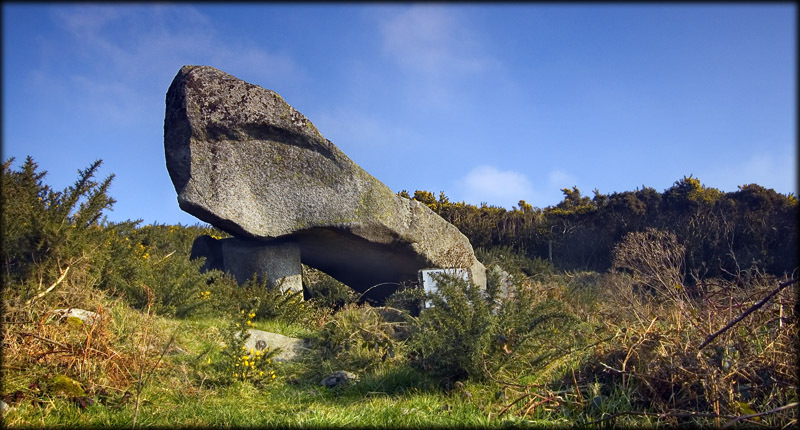 Although partly collapsed the portal tomb situated at Kiltiernan in the foothills of the Dublin mountains is still quite an impressive sight. 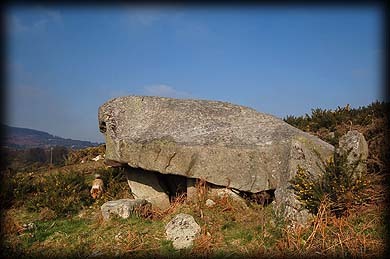 From the front of the tomb the capstone stands out from the surrounding gorse like a huge sphinx and measures some 6 metres long by 4 metres wide and weighs an estimated 40 tons. 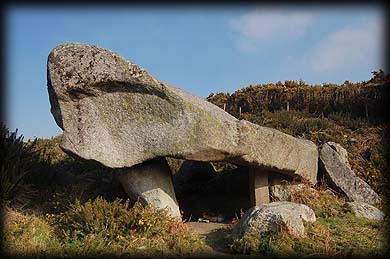 You can see from the picture below that the capstone has slipped off the backstones and it is now supported by a modern concrete block, do not let this fact stop you from visiting this wonderful dolmen. 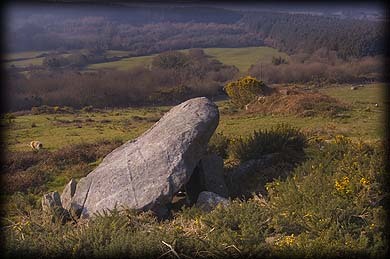 There are a number of smaller boulders scattered around the front of the tomb and a small outcrop to the rear. Situated: From Dublin city take the M50 south. Take exit 15 and head to Kiltiernan, from here take a right turn at the texaco garage. You will come to a sharp bend with a cul-de sac straight ahead, take the right turn down the cul-de-sac and follow the road until you come to a ruined church. Turn left here and follow the road till you come to another bend with a farm track immediately on your right, Take this track through a gate and follow the yellow wall this will lead you to the Dolmen. There has been a problem with access to the site over the last few years and you might not be able to visit. Discovery Map 50: O 196 224. Last visit February 2008.